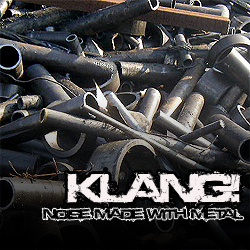 Klang! is a compilation of noise, abstract, minimal and dark ambient tracks created of sounds culled from metal objects. Those densest of elements, manufactured into so many assorted apparatuses of modern convenience, are beaten, plucked, bowed, abused, misused and processed for your listening pleasure in this diverse collection of offerings from a wide range of sonic reprobates.